Multiphase flow and heat transfer have found a wide range of applications in nearly all aspects of engineering and science fields such as mechanical engineering, chemical and petrochemical engineering, nuclear engineering, energy engineering, material engineering, ocean engineering, mineral engineering, electronics and micro-electronics engineering, information technology, space technology, micro- and nano-technologies, bio-medical and life science,etc. With the rapid development of various relevant technologies, the research of multiphase flow and heat transfer is growing very fast nowadays than ever before. It is highly the time to provide a vehicle to present the state-of-the-art knowledge and research in this very active field. 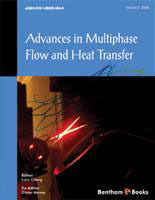 To facilitate the exchange and dissemination of original research results and state-of-the-art reviews pertaining to multiphase flow and heat transfer efficiently, we have proposed the e-book series entitled Advances in Multiphase Flow and Heat Transfer to present state-of-the-art reviews/technical research work in all aspects of multiphase flow and heat transfer fields by inviting renowned scientists and researchers to contribute chapters in their respective research interests. The e-book series have now been launched and two volumes have been planned to be published per year since 2009. The e-books provide a forum especially for publishing these important topics and the relevant interdisciplinary research topics in fundamental and applied research of multiphase flow and heat transfer. The topics include multiphase transport phenomena including gas-liquid, liquid-solid, gas-solid and gas-liquid-solid flows, phase change processes such as flow boiling, pool boiling, and condensation etc, nuclear thermal hydraulics, fluidization, mass transfer, bubble and drop dynamics, particle flow interactions, cavitation phenomena, numerical methods, experimental techniques, multiphase flow equipment such as multiphase pumps, mixers and separators etc, combustion processes, environmental protection and pollution control, phase change materials and their applications, macro-scale and micro-scale transport phenomena, micro- and nano-fluidics, micro-gravity multiphase flow and heat transfer, energy engineering, renewable energy, electronic chips cooling, data-centre cooling, fuel cell, multiphase flow and heat transfer in biological and life engineering and science etc. The e-book series do not only present advances in conventional research topics but also in new and interdisciplinary research fields. Thus, frontiers of the interesting research topics in a wide range of engineering and science areas are timely presented to readers. In volume 2, there are seven chapters on various relevant topics. Chapter 1 deals with the passive condensers. The condensation phenomenon plays an important role in the heat transfer process in the chemical and power industry, including nuclear power plants. Condensers that are based on natural forces are called passive condensers and they do not require pumps or blower to move fluid. Examples of passive condensers include passive condenser systems in nuclear reactor safety systems, closed loop heat pipes, passive condenser for harvesting dew from surrounding humid air and passive refrigeration systems. In nuclear reactors, there is a greater emphasis on replacing the active systems with passive systems in order to improve the reliability of operation and safety. Heat pipes with passive condensers have been developed to transport high heat flux from electronic devices. In practical operations of the passive condensers, small amounts of non-condensable gas may exist in working vapors due to characteristics of the system or dissolution of working vapors. It is well known that the presence of non-condensable gases in a vapor can greatly reduce the performance of condensers. This is because of the fact that the presence of non-condensable gas lowers the partial pressure of the vapor, thus reducing the saturation temperature at which condensation occurs. In this chapter topics on state-of-the art passive condensers, are covered including various types of passive condensers designs and their applications. The theory of passive condensation, condensation models, and experimental work on the passive condensers are presented. Practical heat transfer relations applicable to various passive condensers are presented and discussed. Chapter 2 presents a topic on phase inversion,a phenomenon where the continuous phase of a liquid-liquid dispersion changes to become dispersed and the dispersed becomes continuous. Phase inversion has important implications for a number of industrial applications where liquid-liquid dispersions are used, since the change in the mixture continuity affects drop size, settling characteristics, heat transfer and even the corrosion behaviour of the mixture. In pipeline flows, phase inversion is usually accompanied by a step change or a peak in pressure drop. The chapter reviews the work on phase inversion during the pipeline flow of liquid-liquid mixtures when no surfactants are present. Investigations have revealed that in pipes, a transitional region occurs during inversion from one phase continuous to the other, characterized by complex flow morphologies (multiple drops, regions in the flow with different continuity) and even stratification of the two phases over a range of dispersed phase volume fractions. The observations on the phase inversion process in pipelines are discussed and the parameters which affect the phenomenon are summarized. In addition, the various models available for predicting phase inversion are analyzed, as well as the methodologies developed to account for the transitional region with the complex morphologies and the flow stratification and to predict pressure drop during inversion. Chapter 3 presents a study of heat transfer and friction in helically-finned tubes using artificial neural networks. The last few decades have seen a significant development of complex heat transfer enhancement geometries such as a helically-finned tube. The arising problem is that as the fins become more complex, so does the prediction of their performance. Presently, to predict heat transfer and pressure drop in helically-finned tubes, engineers rely on empirical correlations. Tubes with axial and transverse fins have been studied extensively and techniques for predicting the friction factor and heat transfer coefficient exist. However, fluid flow in helically-finned tubes is more difficult to model and few attempts have been made to obtain non-empirical solutions. Friction and heat transfer in helically-finned tubes are governed by an intricate set of coupled and non-linear physical interactions. Therefore, obtaining a single prediction formula seems to be an unattainable goal with the knowledge engineers currently possess. Regression techniques performed on experimental data require mathematical functional form assumptions, which limit their accuracy. To achieve accuracy, techniques that can effectively overcome the complexity of the problem without dubious assumptions are needed. One of these techniques is the artificial neural network (ANN), inspired by the biological network of neurons in the brain. This chapter presents an introduction to artificial neural networks (ANNs), and a literature review of the use of ANNs in heat transfer and fluid flow is also discussed. In addition, this chapter demonstrates the successful use of artificial neural networks as a correlating method for experimentally- measured heat transfer and friction data of helically-finned tubes. Chapter 4 presents a comprehensive review on the heat transfer characteristics of CO2 and CO2-oil mixture in tubes including convective flow boiling, gas cooling, and condensation. Two-phase flow patterns are thoroughly investigated based on physical phenomena, which show the early flow transition to intermittent or annular flow especially for small diameter tube. The physical phenomena for nucleate boiling of CO2 follow the same trends with other organic fluids under the same reduced pressure. The gas cooling heat transfer is critically dependent on the turbulent diffusivity related with buoyancy force due to the large density difference. In the presence of oil, the interaction of oil rich layer and bubble formation is the physical mechanism for the CO2-oil mixture convective boiling. Besides, the gas cooling phenomena with oil should be investigated based on the flow patterns formed by CO2 and oil, and the oil rich layer, whose thickness depends on the solubility of CO2 to oil explain the physical mechanisms of heat transfer. The thermodynamic properties of CO2-oil were estimated by the general model based on EOS, and they are utilized to estimate the properties for oil rich layer and oil droplet vapor core. Through these predicted properties, the convective boiling and gas cooling heat transfer coefficients and pressure drop theoretically were estimated. Condensation of CO2 is not so different from the existing one, so the heat transfer coefficients and pressure drop are well estimated by the existing one developed for other fluids. Chapter 5 summarizes the work done by our research group in recent five years on the nonlinear analysis and prediction of time series from the system of fluidized bed evaporator with an external natural circulating flow. Besides traditional investigations on steady-state characters of flow and heat transfer, the nonlinear evolution behavior of the system was emphasized and explored in this chapter. Measured time series of wall temperature and heat transfer coefficient were taken as the time series for the nonlinear analysis, modeling and forecasting. The main analysis tools are based on the chaos theory. Meaningful results were obtained. Under certain conditions, the signals obtained from the system of vapor-liquid-solid flow boiling were chaotic, which is demonstrated by obvious wideband characteristic in power spectra, gradual decrease in autocorrelation coefficients, non-integer fractal dimension and non-negative and limited Kolmogorov entropy, etc. At least two independent variables are needed to describe the vapor-liquid-solid flow system according to the estimation of the correlation dimension in meso-scale. The shapes of correlation integral curves and their slopes change with the variations of boiling flow states. The identifications of various flow regimes and their transitions can be characterized by the shape variations. Multi-value phenomena of chaotic invariants were found including correlation dimension and Kolmogorov entropy at the same operation conditions, showing the appearance of multi-scale behavior in the vapor-liquid-solid flow. Time series of heat transfer coefficients in fluidized bed evaporators was modeled and predicted by the nonlinear tools and the comparisons between predicted and measured time series were carried out by estimating the statistics characteristics, power spectrum, phase map and chaotic invariants and good agreements were observed. This indicates that a simple nonlinear datum driving model can describe the average or steady heat transfer character with a reasonable accuracy and the transient heat transfer behavior with a general fluctuation tendency for the vapor-liquid-solid flow. These findings are useful for finding new design, operation and control strategies for such complex systems. Chapter 6 describes the phenomena of air-water two-phase flows with particular application to the design of a drainage and vent system. The detailed knowledge of air-water interfacial mechanism, the propagation of transient air pressure and the flow resistance in a drainage system is essential in order to prevent the damage of trap seal, the unfavorable acoustic effect and the foul odors ingress into the habitable space through the interconnected drainage and vent network. For a drainage system with the air admittance valve at the exit vent of the vertical stack, the control of the propagation of the air pressure requires the understanding of the transient air-water two-phase flow phenomena in each component of a drainage system. This chapter starts with the background introduction for a drainage and vent system. Research works investigating the air-water two-phase flows through vertical, horizontal and curved tubes as well as through the tube junctions are subsequently reviewed. An illustrative numerical analysis that examines the transient air-water two-phase flow phenomena in a confluent vessel with multiple joints feeding the stratified air-water flows is presented to demonstrate the CFD treatment for resolving the complex transient air-water two-phase flow phenomena in the typical component of a drainage system. Chapter 7 presents a study on convective boiling heat transfer of pure and mixed refrigerants within plain horizontal tubes. An experimental study is carried out to investigate the characteristics of the evaporation heat transfer for different fluids. Namely: pure refrigerants fluids (R22 and R134a); azeotropic and quasi-azeotropic mixtures (R404A, R410A, R507). zeotropic mixtures (R407C and R417A). The test section is a smooth, horizontal, stainless steel tube (6 mm I.D., 6 m length) uniformly heated by the Joule effect. The flow boiling characteristics of the refrigerant fluids are evaluated in 250 different operating conditions. Thus, a data-base of more than 2000 data points is produced. The experimental tests are carried out varying: i) the refrigerant mass fluxes within the range 200 - 1100 kg/m2s; ii) the heat fluxes within the range 3.50 - 47.0 kW/m2; iii) the evaporating pressures within the range 3.00 - 12.0 bar. Experimental heat transfer coefficients and pressure drops are evaluated varying the influencing parameters. In this study the effect on measured heat transfer coefficient of vapour quality, mass flux, saturation temperature, imposed heat flux, thermo-physical properties is examined in detail. The effect on measured pressure drops of vapour quality, mass flux, saturation temperature and thermo-physical properties is examined. In this chapter the attention is focused also on the comparison between experimental results and theoretical results predicted with the most known correlations from literature, both for heat transfer coefficients and pressure drops. As the founding editors of the e-book series, we are very happy to see that the e-books are now available to our readers. We are very much grateful to the authors who have contributed to the chapters. It is our great wish if the e-book series is able to provide useful knowledge to our community and to facilitate the progress of the research in the field of multiphase flow and heat transfer.